The memory usage of the process "zeitgeist-daemon" goes too high after doing a couple of searches in the Dash. It is around 16mb on startup, but after using the Dash a couple of time to open some programs, or search for some files, it goes over 200mb, some times even over 300mb. The memory is not freed until restart or the process is killed. I attach a screenshot of the system monitor, showing Zeitgeist-daemon using over 380mb. Mr. Lotfy, has this bug been looked at for Oneiric? If there's a branch I could test I'd be all up for that. For now I unfortunately cannot boot into Oneiric to see if it is still affecting in the first place. I have this bug on both my two computers with Natty desktop i386, it is very consistent. If i use dash a couple of times the zeitgeist-daemon memory usage runs very high. 100 - 200+ Mb. This bug can not be only on 64-bit. been having the high cpu usage with zeitgeist until current updates (3 sept 2011 0722 SAST). still get high cpu usage for a few minutes then it drops. maybe 5 minutes. will reboot and time it quickly. im remotely accessing it and using top on different pc. All seems normal now. been up for 4 minutes. ssh'd into laptop (samsung rv510 - celeron dual, 2gb, intel graphics) before login and zeitgeist-daemon popped up briefly in top and then subsided. seems stable(r) now! Thanks for a great product guys! After running several tests (all same results), using dash for 2-3 searches it quickly goes over 100 Mb memory usage, and it does not drop, even after several hours. I have installed last week Ubuntu 11.04 64bit on a new machine. I am running the GUI using Unity. However I have noticed that after a short time the process zeitgeist-daemon starts using excessively the machine's memory. Up to 800 - 1000 MB! This one had Ubuntu 11.04 64bit running without problems for several months with using Gnome. The last few days I have changed to Unity and the exact same problem as above occurs. I am forced to kill the process otherwise I am unable to keep working with the machines as the process forces the OS to use virtual memory and everything starts to run terribly slowly. My Zeitgeist-daemon stop at around 2.9 GB and my computer Can then not move the mouse. I really hope this bug will be made ​​in Oneiric Ocelot!! Can everyone affected paste the output of the command 'uname -a' please? While waiting for the bug to be fixed, is there any quick-fix? Did anyone of you find a way for disabling this software? I also had this zeitgeist-daemon memory leak while I was using Natty. When I updated to Oneiric Ocelot, the bug was still there. So I've uninstalled zeitgeist fts extension and it seems to be fixed, but I noticed I'm not able to search files with Dash now. > I also had this zeitgeist-daemon memory leak while I was using Natty. > When I updated to Oneiric Ocelot, the bug was still there. > but I noticed I'm not able to search files with Dash now. > doing a couple of searches in the Dash. > restart or the process is killed. Good to know you are on to it. I am also on Oneiric on a eee Netbook. Still no update on this annoying issue? For some time I've stopped having the issue as I removed all zeitgeist packages using synaptic. However after a month the daemon got reinstalled by itself. I have solved by removing "again" all zeitgeist packages. However is interested can do the same by marking for removal libzeitgeist, zeitgeist, zeitgeist-datahub, zeitgeist-core, zeitgeist-extension-fts and then applying the changes. Removing these packages "fixes" the issue and doesn't cause any major issues using Ubuntu. Of course a proper bug fix would be ideal! Have you tried our latest zeitgeist from our ppa? > Still no update on this annoying issue? > by itself. I have solved by removing "again" all zeitgeist packages. > then applying the changes. > Of course a proper bug fix would be ideal! I have this very high memory problem on multiple computers. Others are 32 bit, but this one seems to be 64. Can you send us how much memory and how long you have been using it? > 32 bit, but this one seems to be 64. I am also getting this problem I have a 64bit machine running 6GB RAM, at times this consumes 1.9GB of RAM causing all my programs to freeze, I am using Ubuntu 11.10. This was a new download and installation yesterday! After using search in Dash (finding application) memory spikes to 5,9 GiB. That's due to Zeitgeist-fst which is using 4,9 GiB. The strange thing is.. When I check Synaptic for zietgeist-fts than the the status is...it's not installed! Are any of the affected people using Ubuntu One to synchronize large part of their home directory? I sync +12Gb data, counting +12.000 files, my Zeitgeist normally uses around 200Mb memory. Running Oneiric 64 - K 3.0.0-17- Unity - zeitgeist 0.8.2-1 - Ubuntu One sync with about 2.2 GB (not often changed) on an AMD Phenom X4 and 4 GB memory. Zeitgeist-daemon easily skyrockets ocupying up to 2 GB (last time I checked). Right at this moment System is on for the last two hours, mostly in standby mode, pratically no processing, and it is already using 400 MB. It didn't seem to happen a couple of weeks ago. I'm can't figure what might have changed. Installed zeitgeist 0.8.99~beta1-1~ppa1 from “Zeitgeist Framework Team” team PPA and zeitgeist-daemon is back to normal (1,2 MB). Still following the behaviour of zeitgeist-fts (now at 195MB). I believe I am affected by this bug. On my system (12.04) my zeitgeist daemon is typically very low (< 5MB), whereas with zeitgeist-fts, after a search in the dash for documents it instantly skyrockets to over 100MB memory. zeitgeist-fts is currently sitting at 261 MB for me. I am wondering if it has anything to do with the music folder? > I am wondering if it has anything to do with the music folder? That could be. Ubuntu One was also using over 200 mb of ram. Estimado David: muchas gracias por tu solución. La buscaba hace tiempo. Thanks dwt, that worked for me too. It will solve the problem for a while. Same problem with zeitgeist-fts current 149 mb of ram. After "zeitgeist-daemon --replace &" is decreased to 1,7 MiB. Is there any progress with this? Renaming the mentioned folder solves the issue, but this isn't a solution for this bug. 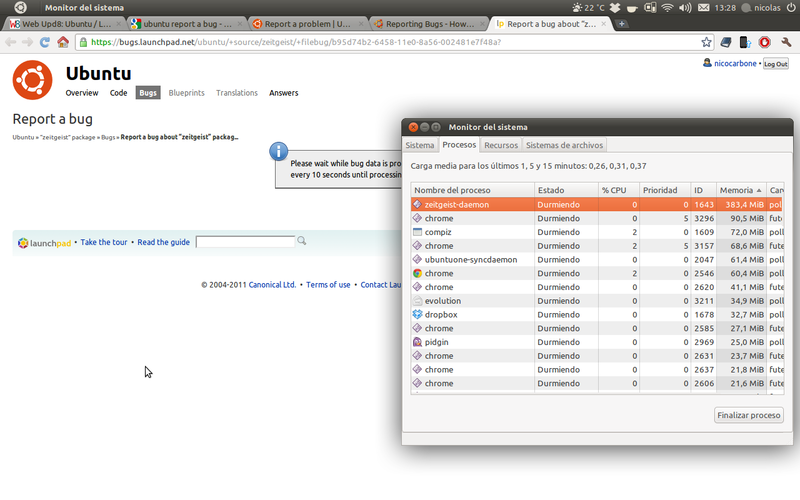 I can test any patched version on ubuntu 12.04.2. > issue, but this isn't a solution for this bug. > I can test any patched version on ubuntu 12.04.2. 2. What ppa are you talking about? I'm eager to solve this issue as soon as possible! Just 2 days ago we managed to push a really big improvment. I’m using 13.04 daily for months, but recently (less than a week) effected with this bug. "zeitgeist-fts" eats about 300 MB (15%) of RAM once I open Dash. Other zeitgeist processes are less than 5 MB. > zeitgeist processes are less than 5 MB. It seems to solve the memory usage problem, but the results of searching in the dash are few. @Seif, unfortunately it doesn't solve the problem for me. zeitgeist-fts after your two commands comes back to ~230MB. It's a good news to know that someone is working on it! In my 13.10 zeitgeist-fts is using 390-400Mb RAM as 13.04! I can confirm this in 13.10. Often when using dash some race condition occurs and the whole unity interface gets distorted with a logoff through terminal only solution. My zeitgeist-fts starts at 140 mb and goes up depending on what task i perform on my desktop.